11.1901: Completed by John Gibson & Sons, Fleetwood (Yd.No.) 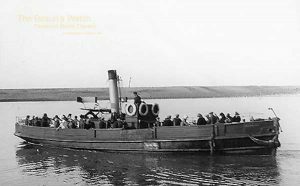 for The Fleetwood Urban District Council, Fleetwood as the ferry, BOURNE-MAY. 28.11.1901: Registered at Fleetwood, Joseph Tildsley appointed manager. 23.4.1907: Thomas N. Croft appointed manager. 23.10.1917: Bazel Shepherd appointed manager. 9.11.1933: Borough of Fleetwood incorporated. 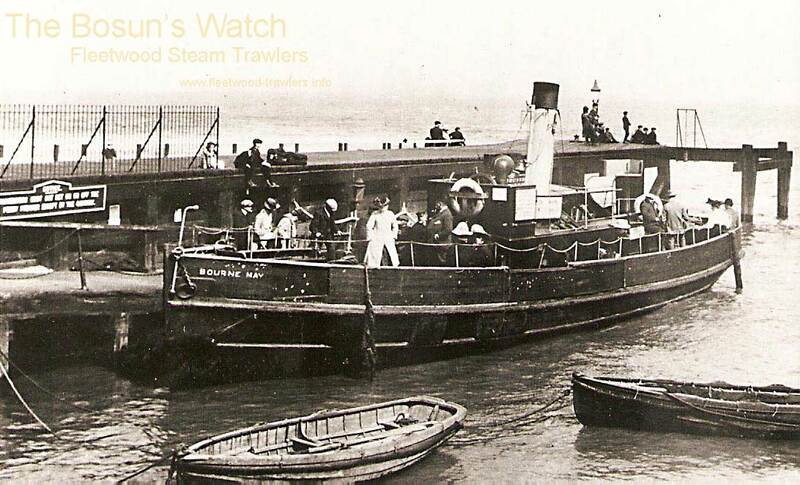 9.6.1936: Registered as a fishing vessel at Fleetwood (FD57). 1944: Sold for breaking up. 24/02/2018: Removed FMHT watermarks from images. This entry was posted in Steam Trawlers, Steamers (Picture) and tagged John Gibson on May 20, 2012 by Fred Smith. 16.12.1870: Completed by John Gibson, Fleetwood (Yd.No.14) for Thomas Leadbetter, Fleetwood & Others as WONDER. 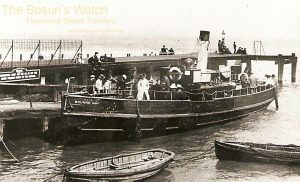 1871: Registered at Fleetwood (FD68). 1881: Census at Fleetwood – John Leadbetter (36), b-North Meols, master; John Leadbetter (38), b-North Meols, mate; Spencer Sumner (26), b-Warton, AB; William Leadbetter (15), b-Fleetwood, AB: Robert Leadbetter (13), b-Fleetwood, cook. 24.10.1887: Sold to John Leadbetter, Fleetwood & Others (John Leadbetter, managing owner). 1910: Owned by Richard Ashcroft. 1918: Sold to Thomas W. Dixon, 38 James Street, Whitehaven (managing owner). 23.2.1922: Fleetwood registry closed. Transferred to Whitehaven. This entry was posted in Sailing Trawlers and tagged John Gibson, John Leadbetter, Smack, Thomas Leadbetter on February 24, 2009 by Fred Smith.